One of the essential steps in living a long and happy life is making time to care for yourself. People underestimate the power of eating fresh and unprocessed foods and how they can affect your well-being. Nowadays it is well documented in scientific literature that a healthy diet, combined with regular exercise, can prevent various diseases such as certain types of cancer, metabolic, cardiovascular disease and mental disorders. 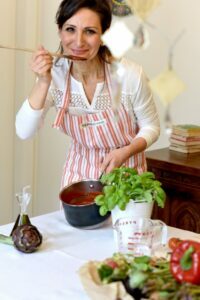 There are two reasons why the Italian lifestyle keeps most Italians fit and healthy: We eat genuine food and we are physically active. We walk everywhere, whenever possible. 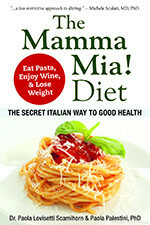 Whether you live in Italy or not here is a list of habits you can adopt according to my new book : The Mamma Mia Diet!. 1. Shop intelligently. Plan your meals, make a list of “good” food (not junk food) and buy only what’s on the list. Having “wrong” food at home will also cause too many temptations. Read labels, it is important to be aware of what there is in your food. 2. Respect meals during the day. Never skip the 3 main meals: Breakfast (the most important of the day), Lunch and Dinner. Eat two light snacks throughout the day (one in the morning and the other one in the afternoon, preferably a piece of fruit or a few fresh, unsalted nuts. Fast food is not always junk food.). This will keep your hormone peaks stable, preventing insulin peaks that lead to weight gain. More importantly, rather than tracking weight, you should be aware of your body composition. Body composition reveals the relative proportions of fat and lean mass in the body. 3. Prefer quality to quantity. Shop for fresh, seasonal and unprocessed ingredients, avoid fast and junk food. In other words, when buying food at the market focus on things that have not been cooked and prepared. Fill up on fresh vegetables and fruits, rich in vitamins, mineral, antioxidants and fiber (at least 5 portions a day). Eat more healthy carbohydrates (such as whole grains, as well as legumes which are also rich in protein) and reduce unhealthy carbohydrates (such as white flour, refined sugar). Use less salt and fats (preferring extra virgin olive oil). Avoid unhealthy fats such as trans fats present in vegetable shortenings, margarine and hydrogenated vegetable oils). Eat fish (rich in omega 3 fatty acids and good for our heart) at least 3 times a week and meat twice a week (preferring poultry to red meat). Other sources of protein are eggs, milk and cheese. 4. Think about smaller portions to control your weight : use a smaller plate so the amount of food seems more because of an optical illusion (Delboeuf Illusion). You think that things are smaller when you compare them to things that are larger. 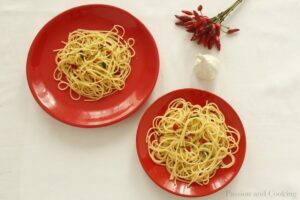 So if you put a small amount of pasta for example on a large plate, your mind will tell you to put more pasta on the plate. Instead if you put the same amount of pasta on a smaller plate, your mind will tell you that you are eating enough pasta, so you will stop adding to it more. This is a simple trick but it works! 5. Eat home-cooked food as much as possible. Take time to prepare your own dishes instead of relying of what the food industry offers. It is expression of love for yourself and people you care for. 6. Drink plenty of water (about 2 liters, 1/2 gallon) during the whole day. Avoid soft drinks (reduced-calorie drinks too), pre-packaged fruit juices, preferring instead fresh squeezed juices, homemade smoothies and herb tea. Moderate your intake of alcohol and coffee, but drink lots of water, which cleans your body of toxins and helps suppress your appetite. Drink a glass of water before and during each meal. Last but not least enjoy red wine (1 1/2 (women) – 2 glasses (men) a day. 7. Eat with those you love and love what you eat. Your food is not only nourishment, it represents much more, such as affection, caring and enjoyment, a daily pleasure to share with your loved ones. 8. Exercise. Regular exercise is important for physical fitness and general good health. The WHO recommends at least 30 minutes of moderate-intensity physical activity 5 times per week (for example brisk walking) to keep you in good health and 45 minutes of intense physical exercise (for example working out) 3 times per week. 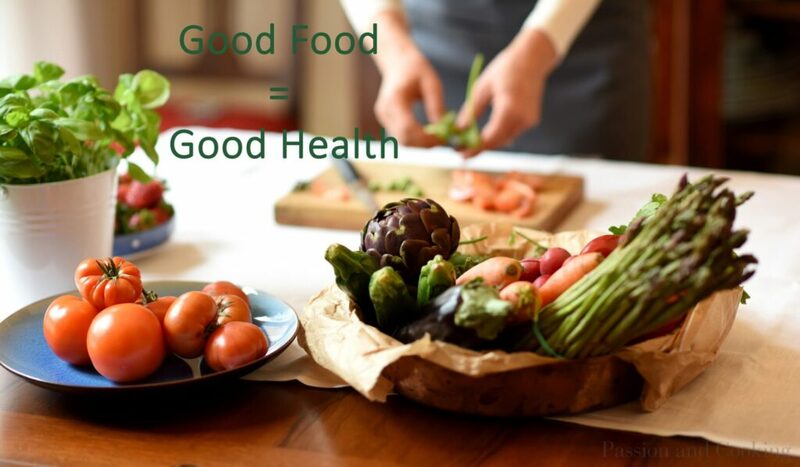 Your body functions at its best, if it is fed by the right foods. If you eat good food, you will have the right amount of energy during training and every day living. Food and training go hand to hand! I like that you pointed out that a good food is best shared with people you love. I guess I will be dining out in an authentic Italian restaurant with my family for my birthday since these two are my favorite. This is a great article since I have been looking for ways to celebrate my birthday. Glad you like my page. Sharing food is very important and part of our culture. Paola what you said about the ‘omega 3 fatty acids and good for our heart’ is great for those want to help lower blood pressure with what they eat. You can’t beat an Italian restaurant for healthy food as long as you find a genuine one (outside of Italy that is). Thanks, Paola for a lovely article.